This is Kayla McKeon, a 23-year-old athlete who'll be headed to the Special Olympics World Summer Games in Athens—she's on the U.S. bocce ball team (the games start June 25). Kayla's participated in a number of sports in the Special Olympics: floor hockey, track and field, bowling, soccer, softball. You name it, Kayla's played it. Don't you feel like a slug right about now? 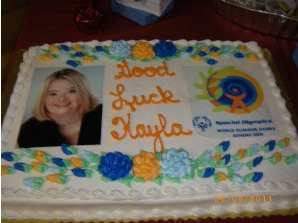 Oh, and wait for it, Kayla's also a Global Messenger for the Special Olympics, and does public speaking on its behalf. 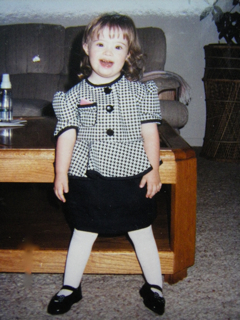 This year, she won the National Down Syndrome Society scholarship. She's also gorgeous and glam; does she know how to rock a dress or what? Through the work I've been doing with P&G, a sponsor of the Special Olympics, I got the chance to interview Kayla and her mom, Patti, and I've been on a high ever since, which makes me a slug with a buzz. Here's what the ladies had to say. Kayla, how do you psych yourself up when it's time to play a game? "We like to huddle and talk about trying our best. We'll just say, 'Go for it!'" What are you most excited to see in Athens? "The Acropolis and the Parthenon, and the changing of the guard. I'm also excited to go shopping! And I loooove Greek food." A girl after my own heart! I hope you get in some great site-seeing and baklava. So, in your blog you say that you like to be "spoiled." My son, Max, likes to be spoiled with purple stuff, his favorite color. What do you prefer? "I love mani-pedis and massages. I love doing stuff with my family and friends, and playing mini golf." "I like to read and sing, though my parents say I'm a better reader than I am a singer! I'll sing in the living room. Fireworks by Katie Perry is one of my favorite songs." I'm wondering, have you watched Glee and if so, what do you think of Lauren Potter? "Yes, I've seen a few episodes. She definitely stands up for us and our world. I like her message: I want to be treated like anybody else, don't treat me differently. But she could use a friend." Maybe you could guest star! You've been speaking on behalf of the End The Word campaign. Why did you get involved? "I have been called the the r-word and it always made me feel bad and upset. I took that word to heart. It's important for people to stop using the word because it hurts other people's feelings...and makes the person using the word look foolish and ignorant. The more people stop using the word, the better. We are not that word—we are people with feelings." Thanks, Kayla. I loved talking with you. Patti, how did Kayla first get into sports? "I read an ad in a local paper about baseball for kids with special needs, the Little League Challenger Division." Max is in that! How old was Kayla? "Kayla was about 11 or 12. She had wanted to be a cheerleader at school, but I figured she couldn't keep up and I said, 'Instead of cheerleading, how would you like to play baseball yourself?' She wanted that big-time!" How did she do with softball? "Kayla started off with t-ball and soon she was hitting the ball herself. She had a bit of a competitive streak even back then. They'd letting kids keep trying to hit the ball. Kayla would get mad and say, 'Three strikes, they're out!' I'd have to explain that there were kids who couldn't play as well as she could." What sort of benefits did you see from her playing a sport? "It made her more confident—she could feel like she was doing it well. Also, until maybe about fifth grade, you have friends in school, and then there's a separation. Being on a team with peers, she made friends that she still has." How did she get into bocce ball? "I'm Italian, and my husband and are bocce ball coaches, so she started playing with us." And how did she start with the Special Olympics? 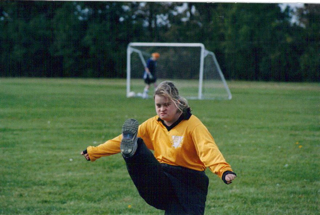 "Someone told me about a local soccer coach who was involved with the Special Olympics. Once you're involved, it snowballs! Someone asked why she didn't play basketball, and so on. It was so great for her. In high school, she couldn't keep up with kids in gym class, they were too fast. 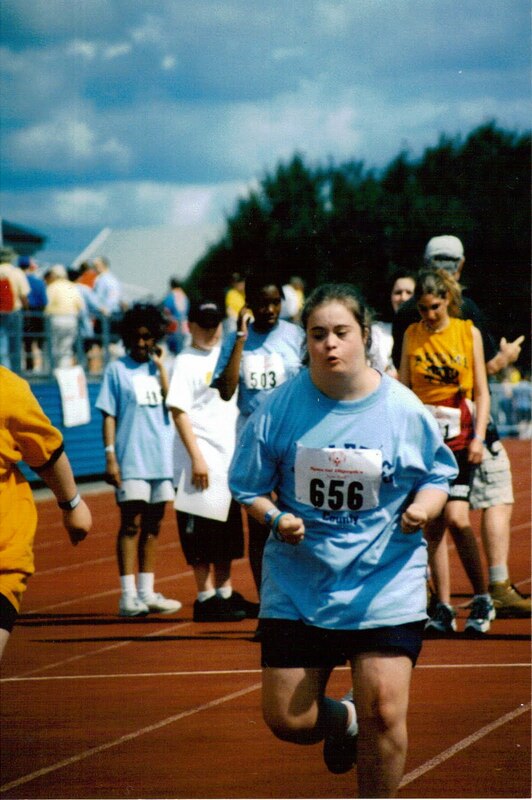 At the Special Olympics, she felt like she was one of them, and she was winning sometimes or making it to home plate. That was a big thing for her. I remember once, when she was a little girl, I was at a party at my sister-in-law's house and all the little cousins were on the stairs. Only when they'd run up, Kayla would be at the bottom, and vice versa. I remember thinking Oh, how frustrating! I don't know if she felt that. 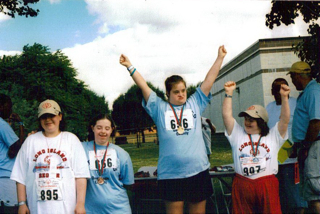 I felt a sigh of relief with Special Olympics—there are no worries about keeping up." "People used to say things to her when she was younger. Now she is such an advocate. Every time I say 'special needs' she gives me a look and I'll say, 'OK, differently-abled!'" How would you describe Kayla's sports style? "It depends on the sport. With bocce, she's strategic. Sometimes, she's aggressive! In floor hockey, you'll hear her saying 'You want a piece of me? Come on, big boy!'" 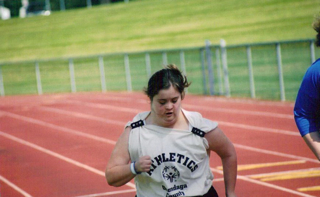 What sort of physical challenges, if any, has Kayla had to work through to play sports? "She has low muscle tone, but sports have strengthened her and she works out a lot. She does kickboxing at the Y and treadmill and push-ups." Patti, what sort of stuff has helped you get through the hard times? "We've had school problems, but I have friends who are teachers I've been able to bounce stuff off. And my husband and I have made many friends with coaches and parents through the Special Olympics. We're always going out to dinner with them. We just had a nice-send off party for Greece and it was mostly Special Olympic people." 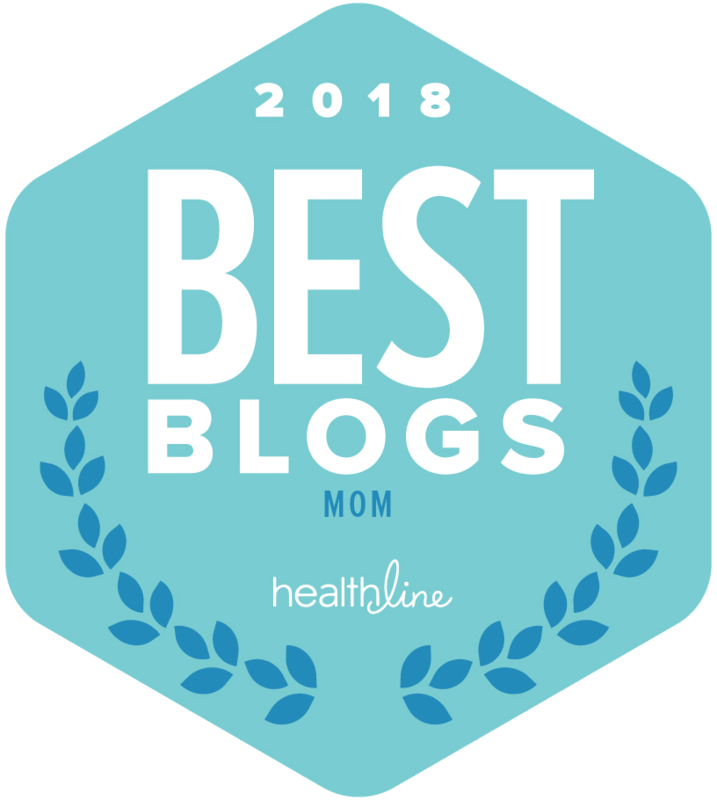 As a parent of a kid with special needs, you sometimes have to deal with other people's pity—even though you know your child is not someone to be pitied. How have you weathered this? "When Kayla was in high school, she got a new aide who wanted to walk the halls holding her hand. We said, 'She's gone through school independent, don't even try to do that!' Kayla has a driving permit! She's passed Regent's exams! There's no reason to pity her." Where do you keep all the Special Olympic medals? "They're displayed in a nice case in her room." What are Kayla's plans for the future? "She's taken an office technology course at school, and wants to work in an office. She types way better than I do—40 words a minute! It's not going to be an easy thing, we're just getting into job coaching. But that's the thing, you can't squash their dreams. If a kid wants to be, say, a dentist, you shouldn't say that won't happen, but you can say 'Maybe you can work in a dentist's office' and pick out that piece of what they can do." Kayla recently said, "I'm obsessed with the can do—not the can't do." That's a fantastic attitude. How have you fostered that spirit in her? "With Kayla, we have always said you can do anything you want as long as you've tried it to the best of your abilities. And she does! We've always treated her as if she didn't have a disability." 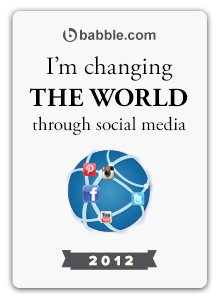 This is the fifth in a series of posts sponsored by P&G, for whom I'm covering The Special Olympics; they're a sponsor! "Like" their Thank You, Mom Facebook page and they'll donate $1 toward Special Olympic Team USA's journey to the World Summer Olympic Games in Athens. Wow! What a gorgeous and talented, young lady! She is amazing, and she does rock that dress. I also think she looked great in the hockey outfit. My Emma thinks hockey rules, and it is great to see a girl playing. I wish her the best of luck in Athens. I would also like to thank her for being such a shining example for our kids--well, all kids really. What a kid! She is awesome! The feather dress is killing me- so glamorous! I love these interviews, Ellen. Keep it up! 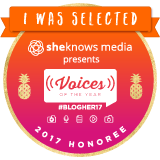 I've been reading Kayla's blog since February this year. 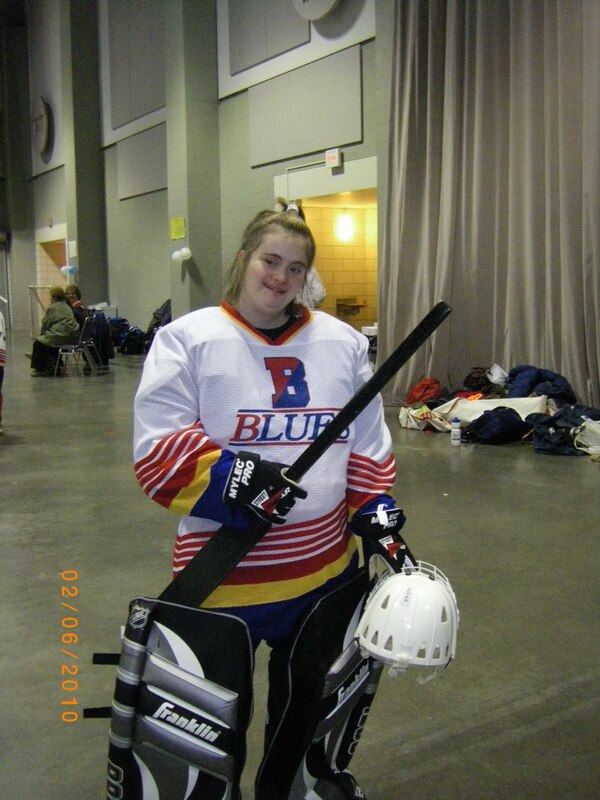 Wonderful to read about the sporting strategies you use, Kayla, in bocce and field hockey. And hope you have some great shopping opportunities in Athens. Check the markets. I'm a better reader than I am a singer, and I also enjoy Firework. (Feta cheese is gorgeous, and so are the olives. Kalamata are the ones we enjoy the most!). Great post, great interviews, great kid! Although she's probably more of a "young lady" than a kid. Her parents must be so proud! I'm with those who are loving that dress, too--she looks great in it. Your introductory photo shows Max in some kind of archway holding on to something. What is it? Is it a doorway, a toy, a piece of furniture.... I simply cannot figure it out and I am completely flummoxed. It kind of drives me crazy. Can you please provide some insight into this? Where was this photo taken and what is the framework that Max is holding on to? Thank you. Wow, wow, WOW!!! What an awesome young woman Kayla is!! Obviously, her parents are pretty awesome, too but Kayla is amazing. Definitely someone for my little guy to look up to! Absolutely Fabulous interview! Job well done. 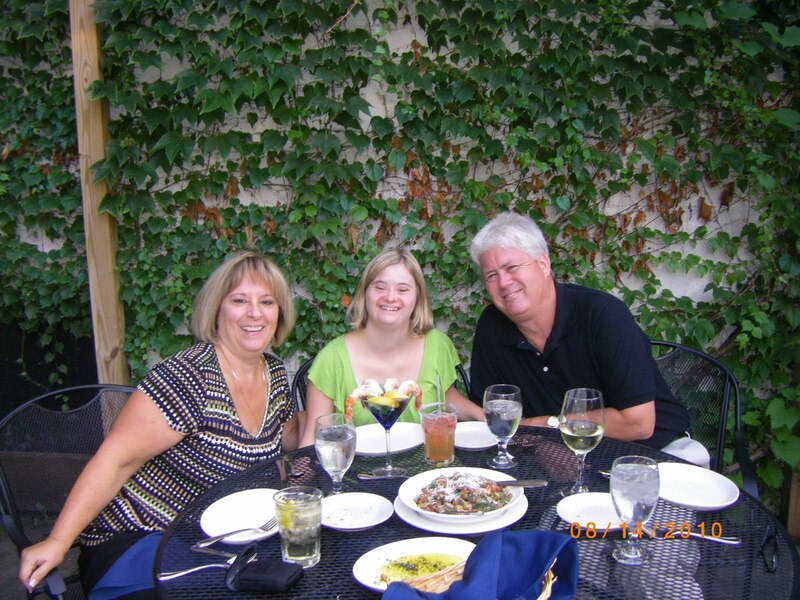 Kayla is an inspiration to special needs folks everywhere, as are her parents. Just goes to show what a positive attitude can get you in life. Thank you for sharing. 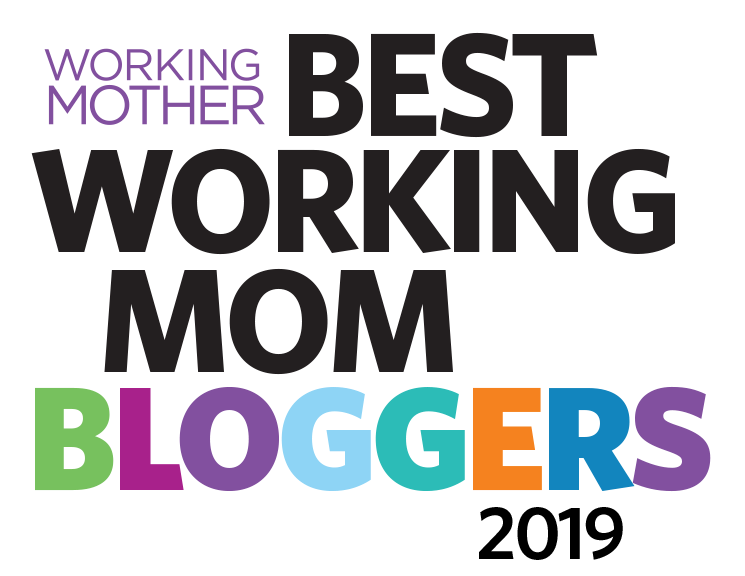 I keep re-reading this because I'm so inspired by Kayla, too! A Nony Mous: Mystery solved! That object is one of those big push-around cars Max! Max used to love pushing it around. The shot was taken through the front of it. Kayla and Patti are such an endorsement for having a can-do spirit. Just amazing. 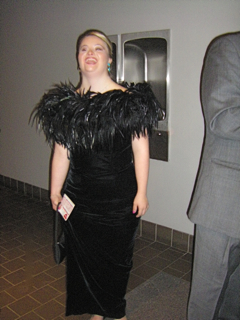 Best wishes to Kayla in the Special Olympics and I hope she has another opportunity to wear that gorgeous dress, or another, soon. You look fabulous Kayla. I probably should say something intelligent or thought-provoking, but I can't get over her feather dress. It's amazing! Hi, Amazing article!!! I love to see and hear stories about how everyone despite there disability can accomplish anything and also the strength we as parents have along with our kids. Great job!! I have a daughter who has special needs and she does special Olympics also. When Amber was younger she always wanted to be a cheerleader to and I also thought the same thing you did, but I went against all odds and put her in cheerleading! She will be 17 and she is going on 4 years as a cheerleader. There has been some challenges but as you know the more they work hard the better they get. Living in a small community there was a lot of doubtful people in the beginning but they have been great! I hear more compliments about Amber and that they come more to watch her cheer than watch the game. Makes my heart shine!!! Keep being the amazing parent you are and congratulations for Having an Beautiful daughter!!! Ok, she's awesome! and that dress is fabulous! Way to Go Kayla! She sounds like an amazing athlete!